You are here: Home / homeschooling / How I Homeschool 5 Grades of Kids With No Stress! 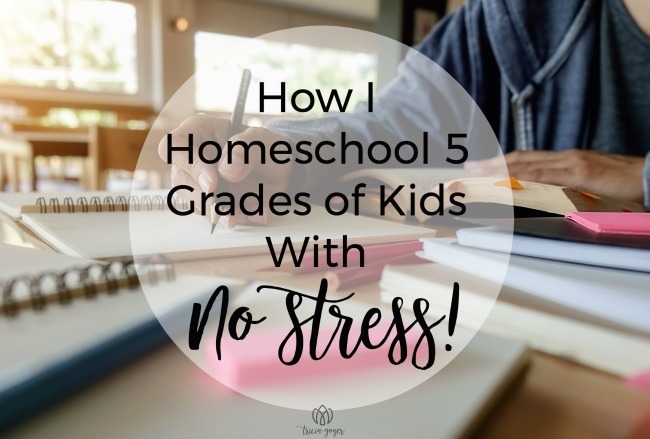 How I Homeschool 5 Grades of Kids With No Stress! How I homeschool 5 grades of kids with no stress — and you can too! People are amazed that I homeschool five grades of kids all at once without losing my mind. I’m actually amazed too. I shared some details about how I do that HERE. In this video, I actually unbox all our books and give you an overview of how I homeschool. Yet, after that, I’ve gotten more questions. A lot more questions. People want details. So I created this new video. In this video, I share how I use two levels of Sonlight curriculum to teach children in Grades 2, 3, 4, 8, 9 and 9th. And the best part is they are all excelling while we are also having fun! Enjoy this video. And if you have more questions please leave them in the comments below! Thank you so much for posting! Our homeschool day is very similar to yours and I have often felt like it wasn’t enough. I didn’t stop to consider that they are learning from what I’m reading to them. Also, you have me the reassurance that I’m doing alright with our homeschool. Thanks so much! Thank you so much for posting how you homeschool all the different grade levels and how it actually is very beneficial to kids who have had IEP’s at public school, it’s very encouraging!